Our little man just turned one, and I can't even believe it! Seriously! Where does the time go?! A year ago he was just a snuggly little newborn, and now I'm lucky if I can get him to sit still for thirty seconds 😉 As much as I miss the snuggles, I have enjoyed every minute of watching him grow and learn. One of the best ways of learning is through play. I love watching him use his imagination and discover how to use his toys. Here's some of his favorite toys and books, and a few things we're getting him for Christmas that we know he'll enjoy! 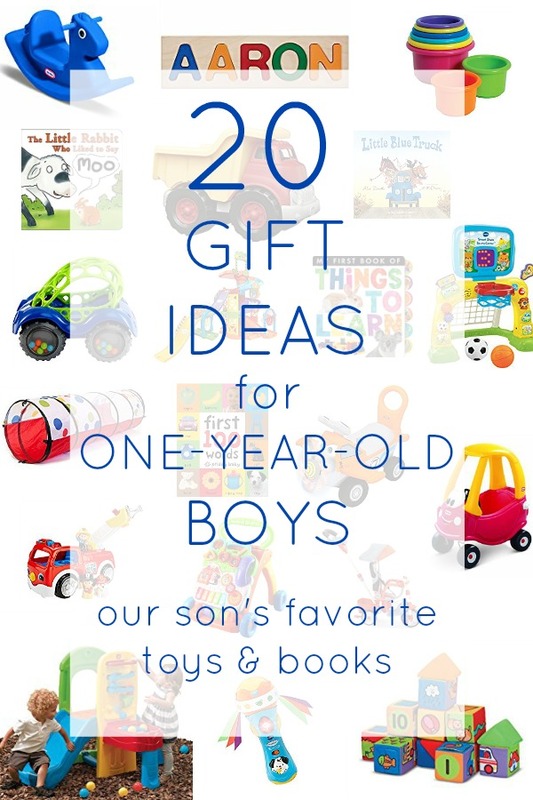 There are plenty of great ideas for birthday or holiday gifts for any of the little guys on your list!!! Little Tikes Rocking Horse- This is a classic! My youngest brother is 13 years younger than me, and I can still remember him having a blast on this rocking horse! Personalized Name Puzzle- A fun way to help them learn how to spell their own name at an early age! The First Years Stacking Cups- Perfect for helping little developing minds grow! Learn how to stack and help develop dexterity. Step2 Play Ball Climber- So much fun for young toddlers! We just ordered this for our son for Christmas! Crawling Tunnel- What kid doesn't love crawling through tunnels? Green Toys Dump Truck- Light weight and made from recycled materials. Our little guy loves pushing cars and trucks around. 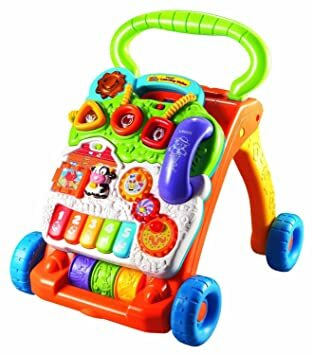 VTech Baby Battle and Rattle Microphone- We bought this when our son was about six months old because we found it as a recommendation, but he didn't really love it until he turned one. Now he loves to dance and "sing" with it! Dusty the Plane Ride-On- This was a gift for Cade's first birthday, and it quickly became his absolute favorite toy. He wore out the batteries in less than a week! He loves riding it around and dancing to the music! Sit-to-stand Walker- This has been a favorite since our little man was about six months old. He used to love sitting in front of it and pushing the buttons. As soon as he could pull to stand, he was cruising across the room with it. I definitely credit it to helping him develop balance and learning to walk. It also has lots of fun learning songs! Rattle & Roll Car- A favorite because it's easy for little hands to hold onto! Little Tikes Cozy Coupe- Another classic must-have toy!!! Little People Lift 'n Lower Firetruck- Toddlers love the Little People toys and this firetruck is perfect for little boys! VTech Smart Shots Sports Center- Such a fun way to teach the little guy about sports! Our son puts balls through the basketball hoop over and over again and loves hearing the toy cheer him on! Little Tikes 5-in-1 Trike- At the top of our list this year! We love going for walks around the neighborhood, and this awesome tricycle grows with your child! Melissa & Doug Match and Build Soft Blocks- Not only great for teaching young toddler show to stack things, but also teaches matching, shapes, and numbers! First 100 Words book- Our son loves to look at the bright pictures of things from his every day life! Things To Learn book- Another favorite for learning words.